We’re always looking for ‘hidden paradises’; the secret gems that no one else seems to have heard about, where no footprints have trodden before. But then when we do find them, authentic and beautiful without traces of exploitation, we’re left a bit perplexed. Should we keep said amazing find to ourselves, selfishly having it for our own private delight, or do we share it with others, so that everyone can experience whatever splendor it is we’ve found? Typically we go with the latter, because I’ve never been very good at keeping secrets. This time the hidden paradise I’m referring to is-in my opinion-one of the most beautiful spots in Taiwan: Long Dong. Located on the Northeast coast of Taiwan, Long Dong (Dragon Cave) gets its name from the shape of the coastline, which resembles the body of a dragon. 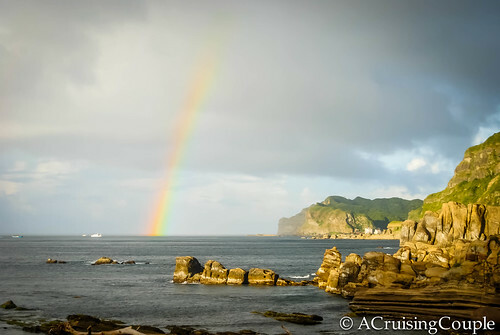 Spectacular, sandstone crags rise 70 meters to the sky while crystal-clear waves crash upon the rugged, sun-baked rocks. Access to the base of the cliffs is only granted after following lengthy footpaths, which promises seclusion and isolation. If ever there was a place for soul searching, it’s here. In all honesty, Long Dong isn’t a complete secret. 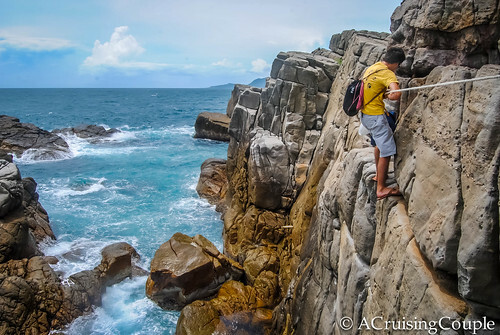 It’s well known to the rock climbing community in Taiwan and all of Asia who flock to the cliffs to take on over 500 routes. 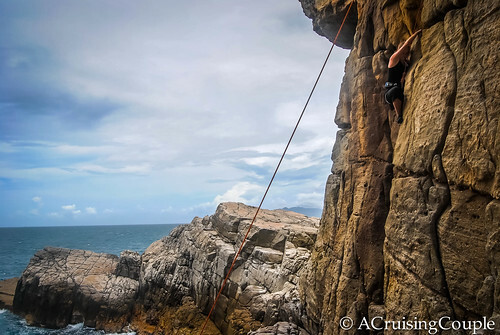 With options for sport climbs, trad, deep-water solo, and bouldering, both advanced climbers and beginners can be kept endlessly entertained. Even as a novice, I can say there’s quite a difference between climbing indoors and outdoors. In a rock gym, there’s little contact with nature, chalk dust fills the air, pop music blares over the speakers; however, in Long Dong, you can feel the cool wind on your face, smell the salty freshness of the Pacific Ocean, and view the stunning panorama of the coastline, all the while with a birds-eye view. 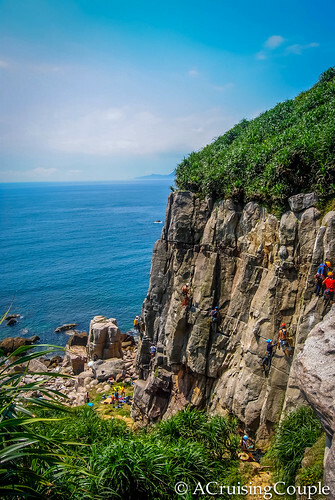 If you want to give climbing a chance or push yourself to new limits, there’s no better place than the cliffs of Long Dong. But Long Dong isn’t just for the rock-scaling, thrill-seeking junkies. Instead of ascending, take a plunge in Long Dong Bay to experience amazing scuba diving and snorkeling. Encounters with stonefish, nudibranchs, scorpion fish, and mantis shrimp are all possibilities, and the conditions are suitable for beginners. Finally, in addition to the rock climbing and scuba diving, there are plenty of short hiking paths around Long Dong, a particularly popular one being the 3km path that leads to the Bitouchiao Lighthouse. Do be careful when hiking around the area though, as there are many sheer drops to the rocky coastline below. Whether you’re an adventurous soul or not, Long Dong is the perfect place to leave technology at home and reconnect with nature—even if it’s only via your favorite book, perched atop a rock, beverage of choice within arms reach. Plus, a day by the sea is restorative and rejuvenating, more healing than prescription pills, more energizing than drinking extra-grande coffees. In terms of grandeur and splendor, it doesn’t get better than the cliffs of Long Dong. Just promise not to tell my secret to too many other people. Access: The best way to reach Long Dong is by car. Alternatively, take the train to Keelung Station, where the Keelung Bus Station has a bus to and from Long Dong. Do check bus times in advance, as they aren’t extremely frequent. It’s my pleasure, Casey. I hope our paths cross some day here in Taiwan. Thanks for a great article! Wow, this place is a hidden gem. Really amazing :). We would love to explore it in the future! Taiwan is one of the most exciting and best countries in the South East Asia. They got panoramic setting, rich culture, thrilling adventures and of course goo cuisines that will keep you coming back for more. We are always surprised that more people skip Taiwan on their South East Asia trips. It has so much to offer for such a small island! Amazing! Do you know if you can lend rock climbing gears there?